Sir Philip Green is behind some of the biggest names on the high streets of Great Britain. His retail empire includes some of the top brands including Topman, Topshop, Miss Selfridge, British Home Stores and Dorothy Perkins. In 1998, he became CEO and Chairman of Amber Day which is a discount retailer. Initially, the shares brought in profit, but later suffered profit downgrades. The company could not survive and Green resigned. Instead he started working with entrepreneurs such as Tom Hunter and Barclay Brothers. In 1995, he partnered with Tom Hunters again and bought sports retailer Olympus. He sold the company for £550 million three years later which made him £73 million richer. Sir Philip Green is actually a high-school dropout. When he was 27 years old, he bought his first store in London where he sold designer brands at discounted prices. In 2000, Greens bought British Home Stores and two years later, he spent a whopping $1.2 billion to purchase retail group Arcadia. Some of the top brands including Burton, Miss Selfridge, Topman, Dorothy Perkins and Topshop are owned by Arcadia. In 2012, 25% of his Topshop empire was sold to Leonard Green & Partners. Having sold the shares for $763, the value of his fashion chain increased to $3 billion. He bought Owen Owen in the 1990s which had twelve branches at that time. By 2004, all of the stores were either sold off or closed. In late 2013, he announced that he would be opening convenience food outlets. Actually he had challenged Marks and Spencer after his takeover bid was rejected in 2005. Green is known for his lavish parties. He flies from Monaco to London in his private jet. In 2005, he paid Beyonce and Andrea Bocelli to perform at his son’s 3-day bar mitzvah celebration. Today he lives and works in the UK and pays tax on his salary. 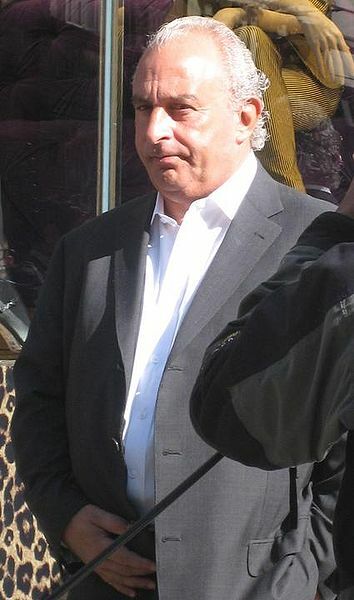 Sir Phillip Green does not own any of his businesses of the Arcadia Group. All his businesses are in the name of his wife who lives in Manaco and pays not even a penny of income tax. In 2005, Sir Philip Green awarded himself a paycheck of £1.2 billion which is the biggest paycheck in the history of British corporate world. Because the funds were transferred to Green’s wife’s account in Monaco through a network of various offshore accounts, Green did not have to pay a penny in tax, but this dodge cost the tax payer close to £285 million. This tax dodge could have paid the salaries of more than 20,000 NHS nurses and fees for over 32,000 students. It is also worth noting that his £5 billion fortune has been built on the back of hardworking labour. He has used sweatshops in Mauritius where Indian, Bangladeshi and Sri Lankans work day and night for minimal pay. © 2014, Famous Entrepreneurs. Copyright All rights reserved.